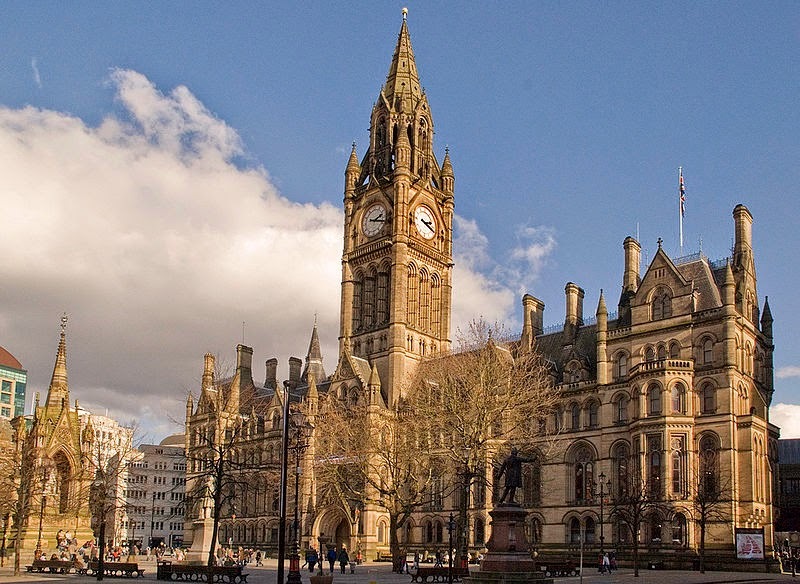 Manchester Town Hall is a Victorian, Neo-gothic municipal building housing a number of local government departments and is the ceremonial headquarters of Manchester City Council. 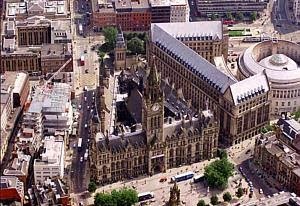 Manchester Town Hall & Town Hall Extension seen from the West. Aerial Photograph Courtesy of www.webbaviation.co.uk © 2005. 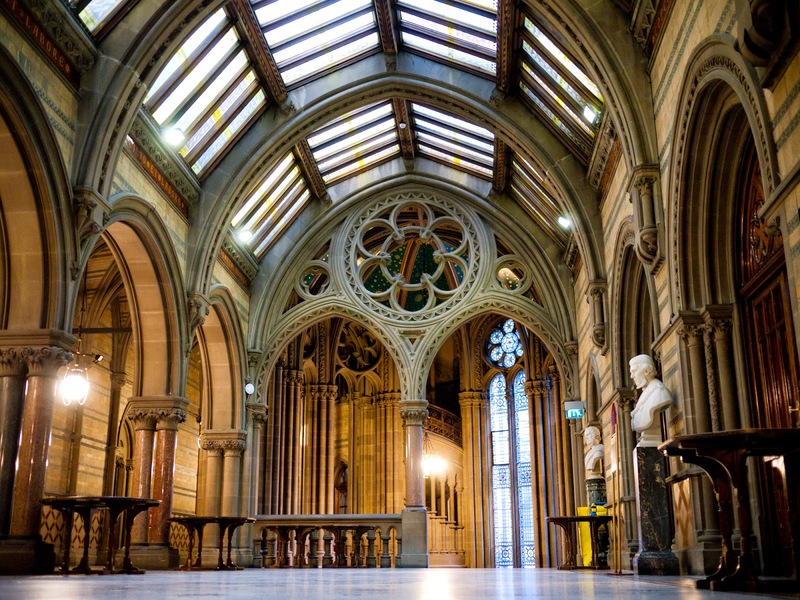 The building was designed by the architect Alfred Waterhouse and completed in 1877. It had to bridge the gap between office and ceremonial requirements and maximise space on its triangular site. The six-storey building has a perimeter of cloister corridors linking offices and everyday workings. The grandiose, ceremonial features of the town hall are centrally located. 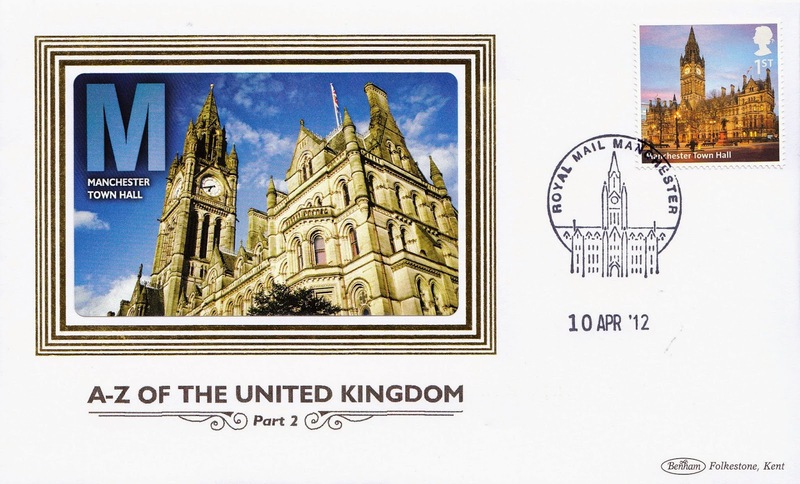 There are two grand staircases by the main entrance of Albert Square leading to the landing outside the Great Hall; the stairs have low risers allowing access for women in Victorian dress. The walls of the staircases have tall, arched windows to admit daylight. There are three spiral staircases to access the first floor from the entrances on Princess Street, Lloyd Street and Copper Street which are constructed in English, Scottish and Irish granite. 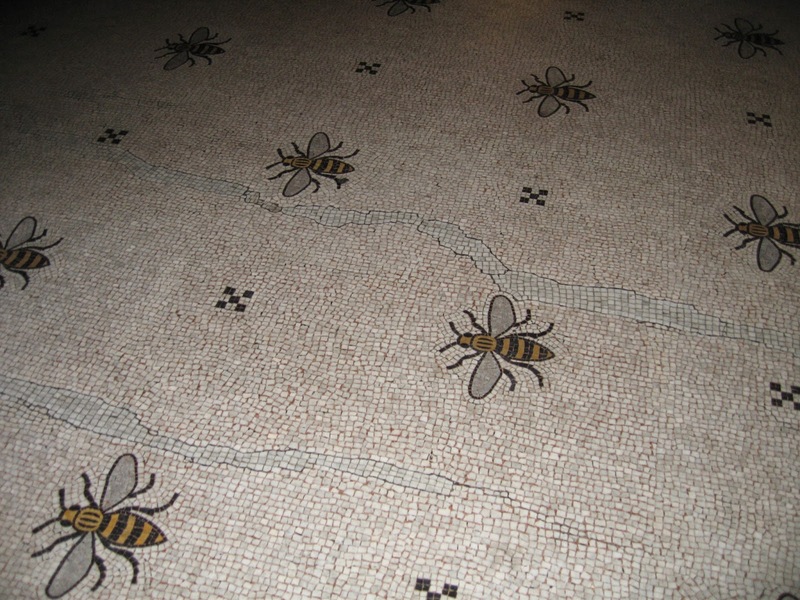 The entrance hall has a mosaic glass roof; the Sculpture Hall on the ground floor contains busts and statues of people who have made significant contributions to Manchester, such as the Anti Corn Law campaigners, Richard Cobden and John Bright and scientists John Dalton and James Joule and Barbirolli. 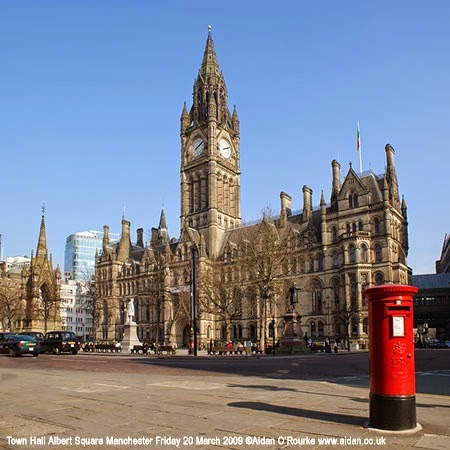 The clock tower dominates the exterior and rises to 87 metres (285 feet) From Albert Square three clock faces are visible and they read “Teach us to number our Days. There are 24 bells in the tower. The Great Hour Bell is called Great Abel after Abel Heywood, The Mayor at the time of the official opening; it weighs 8 ton and 2 cwt. The formal opening ceremony took place on 13 September 1877. There were great problems for Victorian architects to overcome due to the rapid growth and accompanying pollution which included denial of light, overcrowding, awkward sites, noise and accessibility and visibility of buildings. 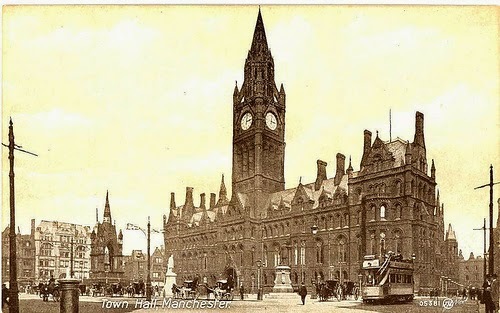 The skyline of Manchester, at the height of the 19th Century. The clever architects addressed these through architectural devices such as suspended first floor rooms, made possible by using iron-framed construction, use of skylights, extra windows and dormers. They ‘borrowed light’ for interior spaces by using glazed white bricks and mosaic marble paving where the light was less strong. 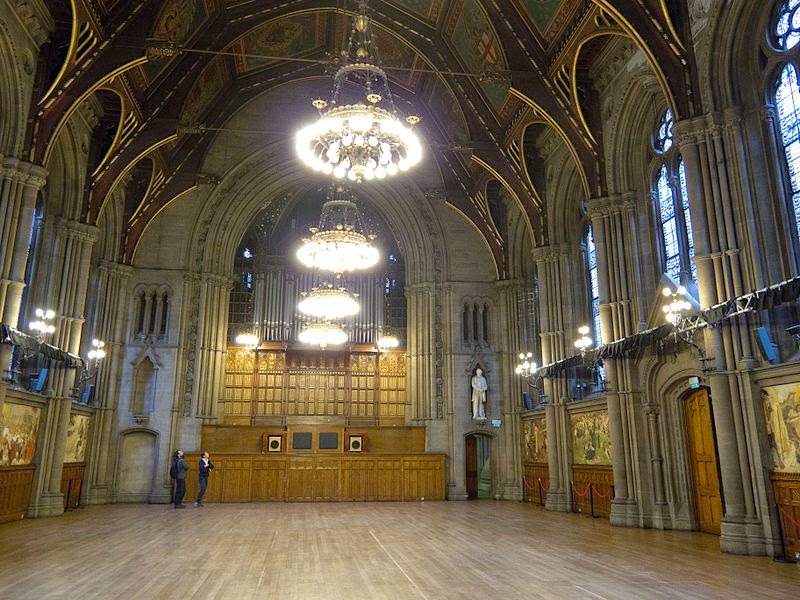 They used clear glass in important rooms and light coloured tints for coloured glazing because the sky of Manchester does not favour the employment of stained glass. Although it was medieval in style it was designed to support the practical technologies of the 19th century. It has gas lighting, a warm-air heating system which provided fresh air drawn through ornamental stone air inlets placed below windows and admitted behind the hot water pipes and ‘coils’ of rooms. Warmed, fresh air was fed into the stairwells and through hollow shafts with the spiral staircases to ventilate the corridors. The pipes that supplied gas for lighting were ingeniously concealed underneath the banister rails of the spiral staircases. The building was designed to be fireproof by using a combination of concrete and wrought-iron beams. 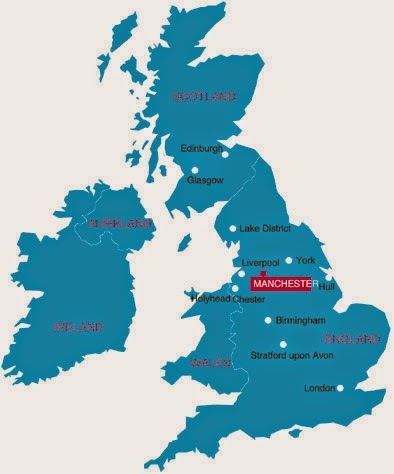 Manchester is only a two hour train journey from London and is the largest city in the North of England and is therefore a major cultural and economic centre. It has its own international airport, which is the second largest in the UK and serves flights to Asia, Africa, Oceania and the Americas. She ignored the boots that were too tight and the blister. What a magnificent building. Thank you for sharing it's beauty and telling us it's history. I really enjoyed this history of a city I was not able to visit when I spent some time in England a while ago. You bring the history to life with that vignette of Betty visiting her sister -- even to the blister. And the commentary is well matched by those photos from Wiki. 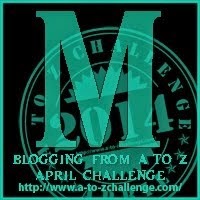 Even to the soot! What changes from then to now. If I could go back in time, I would want to visit the Victorian Age. The world was starting to move fast then. It must have been exciting times with so many possibilities. I love that the building was built with those hobble skirts in mind. Rather cute.